Hummingbirds are the tiniest birds in the world. They are unique, with tiny, saberlike bills and rapid wing beats that allow them to move in many directions in flight. Hummingbirds in the Texas Hill Country give residents a splendid show. Many hummingbirds cross Texas as part of their migration. So how can people help these hummingbirds? Keep a number of things in mind when determining when to put up a hummingbird feeder and provide food for hummingbirds. Hummingbirds are the world's tiniest birds, yet their rapid flight and long migration patterns require great energy consumption. You can time putting up a hummingbird feeder in Austin, Texas, to coincide with their arrival in the spring, when favored flowers bloom in Texas' summer, or keep one up all year. Hummingbirds are the world’s tiniest type of bird. They are only found in the Western Hemisphere and serve a major role as pollinators of plants. They are quite territorial, with males defending their territories with vicious swoops and attacks on other encroaching hummingbirds. Hummingbirds must beat their wings extremely rapidly in order to maintain stable flight as they sip nectar from flowers. In fact, the wings of a hummingbird can beat 80 times per second! This is why these birds have relatively large breast muscles. Hummingbirds possess the largest hearts of all birds. The upper limit of the heart rate of hummingbirds lies in the range of 1,200 beats per minute while flying. At rest, their heart rate drops to about 250 beats a minute. At night, hummingbirds enter a low-energy state called torpor. Male hummingbirds choose territories with plentiful food to attract females. After mating, the male will leave for migration, and the female will raise her chicks alone. She builds a tiny cup of a nest out of spider webs, down and other found fibers; her eggs are the size of peas! Hummingbirds are famous for their nectar diet. However, they also eat small insects and minuscule spiders snatched from webs. This is how they gain protein and fat for their long migrations. They do not eat seeds. Hummingbirds can fly as fast as 50 miles per hour. They can live as long as 10 years. As many as nine hummingbird species make their home in Texas. Austin, Texas, is a wonderful place to observe hummers. Hummingbirds in Texas Hill Country provide a showy display as they whir, bob and zip about from flower to flower and feeder to feeder. Some of the kinds of hummingbirds in the Texas Hill Country around Austin include the black-chinned hummingbird, with its splendid violet chin stripe; the broad-tailed hummingbird; the Rufous hummingbird; and the ruby-throated hummingbird. Once in a while, an Allen’s hummingbird might make an appearance. Further to the south, birdwatchers may see buff-bellied hummingbirds. Hummingbirds in West Texas might include magnificent hummingbirds and blue-throated hummingbirds. Hummingbirds participate in migration in Texas and other parts of North America as they make there way to the winter grounds of Mexico and Central America. They can travel approximately 1,500 miles. It’s hard to imagine such wee birds making that long flight, and yet they do! Males head off for migration first, and then females will follow, as well as the young hummers they raised. Prior to migration, hummingbirds will eat a great amount of insects to fatten up, as well as drink flower nectar and nectar provided by hummingbird feeders. Hummingbird migration in Texas entails a flight of 500 to 600 miles over the Gulf of Mexico or around it, as the birds wend their way south for winter. This is especially taxing for the ruby-throated hummers. It should be noted that many enthusiasts keep up their hummingbird feeders all year round. This will not affect hummingbird migration in Texas whatsoever. Migration is an ingrained habit, likely in tune to seasonal day-length changes. However, birdwatchers get very excited when hummingbird season arrives! The best time to put up a hummingbird feeder is to coincide with the arrival of hummingbirds in the Texas summer. Hummingbirds in the Texas Hill Country arrive around the time of favored blooming flowers. This could therefore be considered “hummingbird season.” More specifically to each species, the first hummingbirds to begin migration will be the black-chinned species, through February. Next will be the ruby-throated variety in mid-March. The favored flowers of hummingbirds in Texas summers can be supplemented by putting up a feeder. Purchase a feeder that is red to attract hummers. A simple solution of sugar in the proportion of one part sugar to four parts water is all you need to provide. Never use honey! Never use artificial coloring either. All the birds need is sugar and water. You will need to clean the feeder frequently if hummers do not drain the supply quickly enough. A good place to put a hummingbird feeder is in a tree. Because of their territorial nature, to keep the peace, you might want to put out a few feeders, spaced out. This will alleviate the threat of pitched hummingbird battles over artificial nectar feeders. Winter is not considered hummingbird season in the Texas Hill Country. You may, however, encounter hummers in winter, so it is a good idea to keep a stocked and clean feeder at the ready so these little birds have a source of energy to help them cope with the cold. Some birders change the solution concentration for their winter bird feeders in the coldest Austin weather. One recommendation is to use one part sugar to three parts water. Care must be taken to keep the feeder cleaned more often in winter as it will not be drained as quickly as in the summer, when there is greater competition. Winter hummingbirds will appreciate and depend on your feeders to keep them going until the season changes. The best way to keep your hummingbird feeder clean and safe is to change it after a few days and scrubbing it before you refill it. This prevents mold growth that can harm hummingbirds. 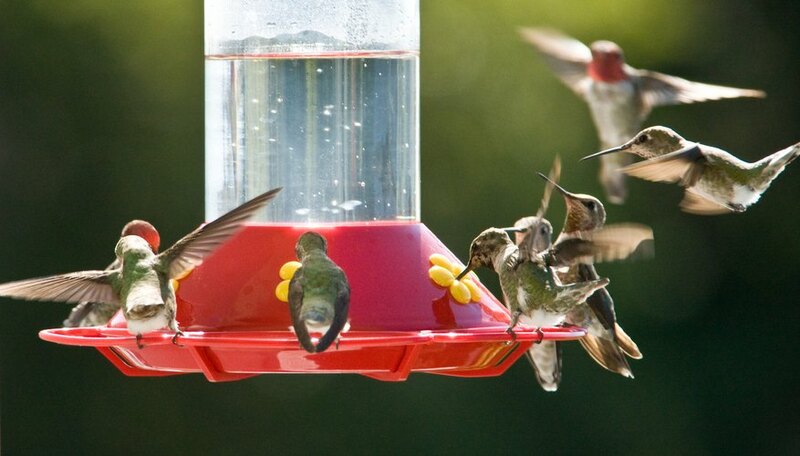 Providing hummingbirds in the Texas Hill Country with feeders is of course a great way to support these active birds. But another great way to help hummingbirds is to plant a garden that provides natural food for hummingbirds in the Texas summer, spring and fall. Since hummingbirds are natural pollinators, the benefits are mutual: They gain nectar, and the flowers are pollinated. Blooms coincide with hummingbird season in Texas. Therefore some good flowers to plant for hummingbirds in Texas summer include honeysuckle, trumpet vine, columbine, hibiscus, mimosa trees, Texas paintbrush, indigo bush, hummingbird yucca, hummingbird bush, Turk’s cap, penstemon, various types of sage, Texas betony and many other plant variations. Ask your local plant nursery what they can provide as natural sources of food for your backyard hummers. Hummingbirds provide flashes of brilliant color, aerial displays, floral pollination and great joy in watching these delightful creatures. Dianne, J.. "When to Put Up a Hummingbird Feeder in Austin, Texas." Sciencing, https://sciencing.com/put-hummingbird-feeder-austin-texas-7626735.html. 01 December 2018.